THE history of the Lockyer Hotel in Forest Hill is about to begin a new chapter, with the pub coming under new management. It caught the eye of Donald and Kylie Shephard - who run the Forest Hill Hotel just across the road. When the opportunity came up to purchase the pub, it simply felt "like the right move" for the Shephards. "It was looking sad and was up for sale - it's a beautiful old building and it just needed somebody to take it on and take care of it," Mrs Shephard said. "It's a beautiful old hotel, and it's got a lot of characters that come in and have a drink and it's definitely got a lot of character in itself." The couple will continue to run both pubs in the town. Renovations on the property are nearing completion and have revamp the historic building, giving it a fresh face while keep the character of the local landmark. Mr Shephard was confident of reopening the hotel within the month. Mrs Shephard said they wanted to ensure the characters of both the Lockyer and Forest Hill Hotels each remained unique. 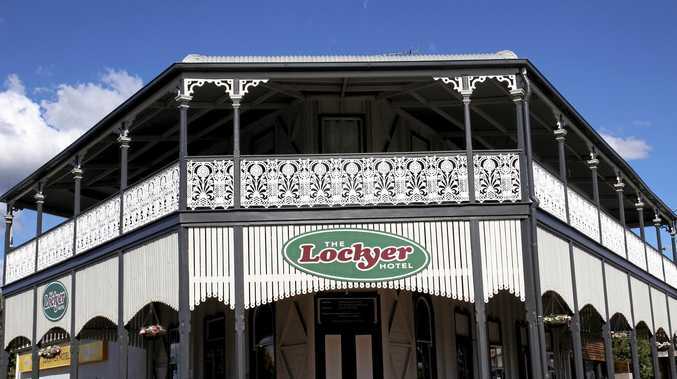 "The Forest Hill is more of an older style where as this (the Lockyer Hotel) will be more of a family style," she said. While they would be hiring a professional chef to run the new look menu, the couple are planning to keep hands on with the running of the business. "It's going to be a family run hotel," she said. The Shephards are planning for the revamped hotel to provide a casual and enjoyable atmosphere for the Forest Hill community to enjoy a meal or a few drinks. The heritage listed building was built in 1906 and in July 2013, the front balcony was heavily damaged after a B-double truck misjudged the tight 90 degree corner in front of the hotel and ploughed into the building. The repairs took 12 months to complete, but the end result was stunning.